Knit-Rite's original Soft Sock® has a new, patented, hemispherically knit three-dimensional distal shape. The new distal shape provides improved fit and comfort versus the traditional flat knit, envelope shape of prosthetic socks. Soft Socks are available in X-Static®-the Silver Fiber®-or original CoolMax®; both are moisture-wicking fibers that move moisture away from skin and inhibit sock odor. Soft Socks feel soft and cuddly worn next to the skin and even insulate against the cold. Lycra provides stretch and excellent fitting qualities. Visit Knit-Rite booth #1101 at the AOPA National Assembly. Trace, Trim, and Walk Away! 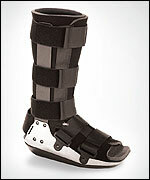 The new WalkOn® Trimable and the WalkOn® Flex AFOs by Otto Bock HealthCare offer high quality with quick customization. You now have a choice of support coupled with the simplicity of shaping the footplate with scissors, allowing you to deliver personalized solutions to your patients wherever they are. Providing a symmetrical and fluid gait pattern with a natural heel strike and good energy return, the new Walk­On Trimable and WalkOn Flex AFOs also encourage outward rotation of the foot during heel strike. To learn more, contact your Otto Bock sales representative. 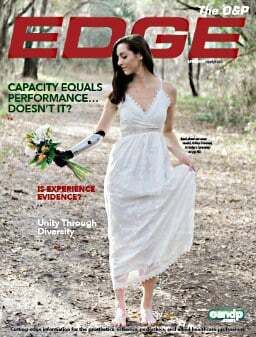 Endolite's lighter-weight EliteVT foot is the ultimate in versatility, shock absorption, rotation, and stability-all in one compact package. Dynamic precision-engineered titanium spring incorporates vertical compression and axial rotation. Progressive response to axial loading, which is most similar to the elastic properties of the natural muscles. Compact, maintenance-free design allows for easy cosmetic finish. Rated up to 365 lb.,36-month warranty. 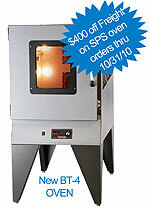 To celebrate the new BT-4 OVEN, SPS is offering $400 off freight costs on ANY OTS oven purchased through October 31, 2010, by U.S. customers only. Four 100-watt heating elements on top and four on bottom. Dual electric fan kit allows low-temperature operation. A channel fits vacuum hoses through the door. Exterior dimension: 32 in. x 50 in. x 58 in. Interior dimensions: 28 in. x 40 in. x 24 in, with 18 in. of clearance for bubble forming. Visit SPS booth #723 at the AOPA National Assembly. PDAC recently reviewed many OPTEC products with the following decisions: VertaMax L0627; Stealth PRO L0631; Stealth Rehab L0627; Stealth X L0637; Stealth LSO LP L0637; Stealth Xtreme L0637; Stealth TLSO with DLK L0462; and Stealth TLSO with ATE L0464, along with many custom spinal products. The Stealth LSO, Oasis LSO, and Oasis LSO LP continue to be L0637. SKINGUARD® Technology silicone liners 6Y75 and 6Y85 from Otto Bock are made with an innovative antibacterial additivethat protects against a wide range of microorganisms. 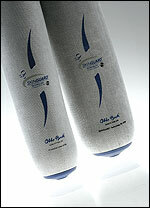 The high-tech material helps increase comfort and durability, improves hygiene, and reduces odor. Best of all, the benefits of SKINGUARD are now available for your transtibial and transfemoral patients who use shuttle-lock systems-and at no extra cost! To learn more, contact your Otto Bock sales representative. Ohio Willow Wood's LimbLogic® VS provides secure and reliable suspension. The system is easy to fabricate, program for patient use, and monitor performance. Visit AOPA booth #601 for information about LimbLogic VS.
Knit-Rite offers the X-Static Mullet Cranial Interface. The Velcro® chin-overlap closure aids in helmet donning. After the X-Static Mullet Cranial Interface is donned, the Velcro closure should be fastened under the chin to help eliminate wrinkles. The Velcro closure should be released once the helmet is in place for patient comfort. One size fits all. Sold individually. Instead of choosing suction or a suspension lock, get both with the new Suction Lock, available at SPS. Receive 10% off the Suction Lock and all associated products, now through October 31, 2010. The Suction Lock contains an air-sealing valve to maintain an airtight socket. No air is allowed into the socket via the release button or the bottom of the socket. 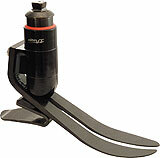 The airtight socket helps to maintain suction suspension, often without the use of a sleeve. This reduces milking, pistoning, and tension on the limb. SPS will lend a pink-covered hand to raise awareness and fight breast cancer. For each SPS order of Trulife Breast Forms during the 4th quarter of 2010, you will receive one FREE box (100-count) of Medline's Generation pink gloves. All Trulife Breast Forms stocked by SPS are eligible for this promotion, including Trulife's new BodiCool, which provides a constant cooling effect by continuously drawing excess heat away from a woman's body. All sizes and shapes of the Harmony, Symphony, SoLight, Active, Featherweight, and partials are included. Orthofeet is offering a variety of innovative Slip-On® shoes featuring a wide opening and hook-and-loop straps for easy on/off. 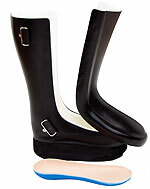 A unique two-way strap system enables fastening on either side of the shoe and easy adjustment of the strap length. Orthofeet's Slip-On shoes are covered by Medicare. Soft fabric lining with seamless construction. Supple leather with foam padding. Lightweight cushioning sole with Ergonomic-Stride™ design. The Tribute® delivers dependable performance in an economical package. The precision gait match provides the user better control and stability. 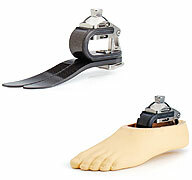 The full-length toe lever and a low-frequency response are ideal for people who require firm footing on varied terrain. The Tribute is an ideal solution for initial fittings and low- to moderate-impact users. Multiaxial function with transverse rotation for natural-feeling performance. Adjustable Stride Control™ offers fine adjustment to an individual's gait. Scaled design allows for more natural proportions. OTS offers the StepLock®, now in its fifth generation. Designed for transfemoral and active transtibial amputees, ALPS Extreme AK/BK Liners have 80% less vertical stretch than other ALPS gel liners. Formulated with GripGel™ to assist in donning and suspension. 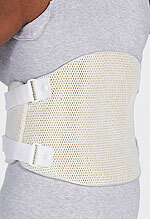 High circumferential stretch assists with form fitting. Wider distal end for donning ease. Distal ends are proportionate to liner size. Available in locking or cushion design. Through November 24, 2010, all Extreme Liners ordered from PEL receive a free ALPS skin reliever when you mention PEL code PC-ALPF10. Available exclusively at SPS, ALPS' new Vacuum Liner (VKDT) has been designed specifically to provide an additional layer of cushion and support. The VKDT has a limited stretch fabric cover with a distal hole to allow air evacuation and obtain a secure suction seal. The VKDT functions as the outer suspension liner and is designed to be used in tandem with the PSI Liner as the inner liner and a flexible inner socket to form one matrix with the Vac-Pin. 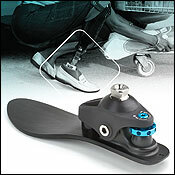 The Seattle LP Foot is Trulife's first low-profile, high-activity foot. Visit PEL booth #612 at the AOPA National Assembly to see the Seattle LP Foot and pick up your PEL Supply show-specials flyer. C-shape replicates true, anatomical plantarflexion. Full-length, split keel for stability on uneven surfaces. 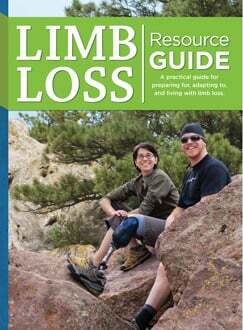 Ideal for amputees with long residual limbs. OPTEC's Stealth is easy to don and doff, and is our most popular anterior-opening brace. The closure system provides smooth compression that can be regulated by your patients. Your patients will actively participate in their rehabilitation by adjusting compression and support to the desired level, enhancing comfort and compliance. Order OPTEC Stealth white braces-Stealth LSO and LSO LP, Stealth X2 and X4, Stealth Pro 2 and Pro 4-now through December 31, 2010, to receive $75 OFF the regular price. OPTEC's Stealth LSO, LSO LP continues to be L0637. The revolutionary Vac-Pin system is available exclusively at SPS. This advancement in suspension technology combines the benefits of a positive suction suspension with the ease, convenience, and simplicity of pin-suspension. The Vac-Pin locks an inner flexible socket and the outer suction socket liner (ALPS VKDT recommended) into one cohesive suspension matrix, providing optimum socket comfort, control, and positive vacuum suspension. The unique design provides a one-way expulsion valve contained within the valve housing. 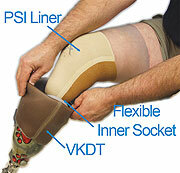 The Vac-Pin is designed for transtibial amputees capable of wearing a total-contact, surface-bearing socket. 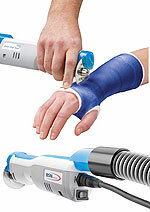 The new BSN medical Delta Cast® Saw is now available at Friddle's. The Delta Cast Saw has low noise and vibration levels, making it one of the more comfortable cast saws for patients and doctors. The Delta Cast Saw is very durable and comes with a two-year warranty. It is well balanced and has a comfortable grip for easy handling. The saw also features two speeds for a variety of cutting options and comes with the new CryoCoat™ blade that stays sharper and cooler than most cast-saw blades. NEVER EVER Fabricate Another Crossbar Strap! Save on technician fabrication time! The new ELF straps-ELbow Flexion crossbar, cable-control straps-are unbreakable and waterproof. 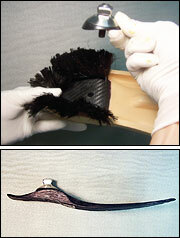 A unique cable-housing tunnel molded into the ELF strap enhances the biomechanics of cable excursion, improving efficiency. Two color choices: tan and black. Available now! 21st Century BODY POWER systems! The Genesis Plus from MICA Corp. is the most natural range-of-motion (ROM) foot in the industry. 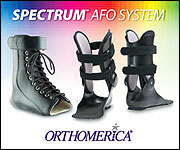 Learn How Orthotic Solutions from Delcam can help you! See how you can repeat identical prescriptions with no messy plaster casting or cast dressing. Delcam's orthotic CAD/CAM solutions are designed by medical professionals for medical professionals, which means that new users can become proficient in under a day. Delcam will work with you to choose the material, software, and scanner that will best suit your business needs. Comfort Products, the innovation leader in knitted orthotic and prosthetic products, announces a 15% discount on their cotton and CoolMax® AFO Liner Socks through December 31, 2010. The AFO Liner Sock is an extra-high crew style that accommodates AFOs, thereby reducing patient irritation, chafing, and perspiration. The nonrestrictive knit top facilitates improved leg circulation. The product comes in three adult and three pediatric sizes. All styles feature a full terry lining for cushioning between the wearer and the orthosis. Visit Comfort Products booth #823 at the AOPA National Assembly. To facilitate Lisfranc and Chopart dynamic alignment, Dycor has added a removable pyramid adaptor to the LCD prosthetic foot. Prior to casting and subsequent to alignment transfer, the pyramid adaptor is removed and the LCD prosthesis is permanently attached with the carbon-fiber "feathers." Dycor's LCD coupling is adjustable in all three planes and requires a 1-in. temporary heel build-up on the contralateral side. Both the LCD coupling and pyramid can be returned for credit. For additional technical information, contact our technical services department.